A perfect button to use in a Virtual Pinball, as well as an Arcade Cabinet. Now at a PERMANENTLY reduced price! SKU: pb08. Categories: Pushbuttons, Virtual Pinball Parts. 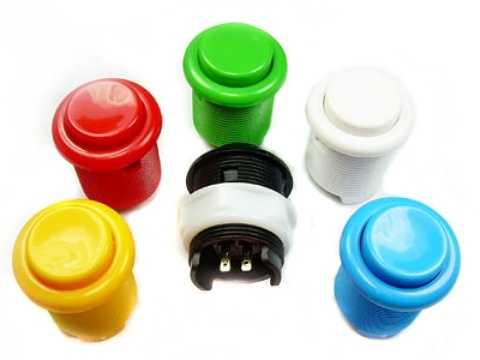 High-Performance Arcade Pushbuttons with integral minature gold-plated leaf switches. Unlike most other pushbuttons on the market, the GoldLeaf buttons use a leaf switch instead of a microswitch. This means no clicking and results in an almost silent button. There is also no internal spring so the button only requires a very light press to actuate it. This makes the GoldLeaf a great alternative to a “proper” leaf switch type button in a pinball machine (Virtual or real), as they offer the same feel but without the hassle of needing to adjust the leaf switch all the time, which can be a pain to get right! The moving part of the button is ultra-light and only 10mm deep unlike other types where the plunger extends the full depth of the button. The type of switch used allows for very accurate contact close and open points resulting in superior accuracy compared to a microswitch. The typical long threaded barrel and nut design provides a perfect alternative to those who want a silent light touch button but need to mount it into a thicker timber panel rather than a thin metal panel that the Sanwa and Seimitsu buttons are designed for. A panel up to 19mm thick is no problem for the GoldLeaf. And of course it HAS to be a dimple top which helps the player “find” the middle of the plunger and further increases accuracy. Gold plating on the switch contacts and external terminals ensure that the GoldLeaf button delivers top performance for a VERY long time! Note that although the terminals are 2.8mm, the larger 6.3mm connectors used in our Wiring Kit will still fit satisfactorily on these buttons – you may just need to give the connectors a light “pinch” with some pliers to help them stay on the terminals securely.